In many organizations you will commonly find multiple users accessing the same mailboxes, which can lead to some users having unauthorized access to sensitive data. It is very important to have suitable monitoring mechanisms in place to make sure that only those with the correct permissions have access to the correct data in shared mailboxes. PowerShell cmdlets enable tracking of shared mailbox access. Using PowerShell cmdlets you can enable mailbox auditing and then view the audit reports in the Exchange Admin Center. With the launch of Exchange Server 2013, audit reports can be accessed through the Exchange Admin Center (EAC) too. In this article, we will show you show to generate these reports using PowerShell commands and view them using the EAC. As you can see in the above image, the “AuditEnabled” parameter is showing “True”. 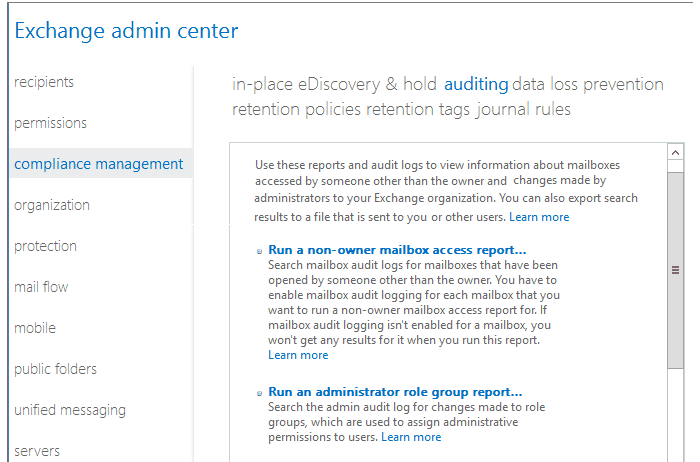 Open the “Exchange admin center”, go to “compliance management”, click on “auditing” tab at the top, and click on “Run a non-owner mailbox access report”. When the search window opens up, enter the start date, and end date. Go to “Search for access by” section, select “All non-owners” from the drop down, and click on “Search”. 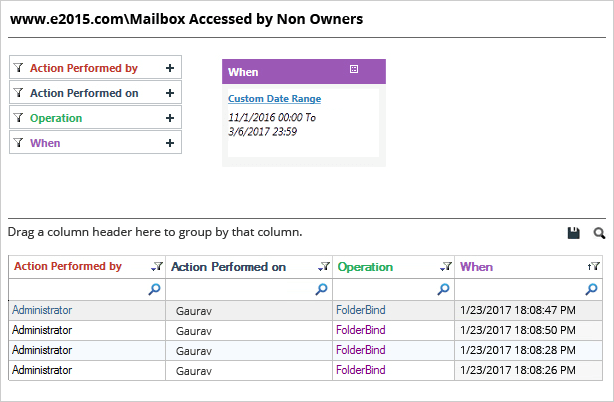 After the search is over, a list showing audited mailboxes and the last accessed times will be displayed on the bottom-left section. If you click on a mailbox in the list, its audit details will be displayed in the bottom-right corner. 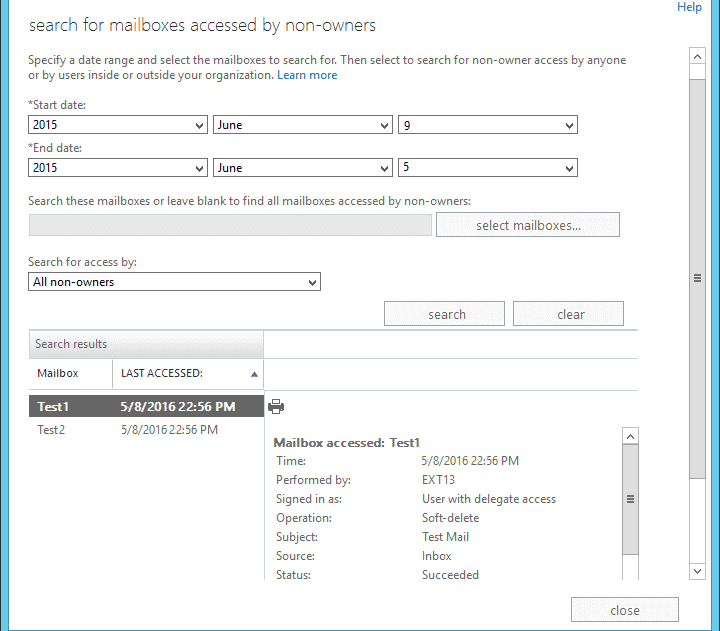 Shared mailboxes in Exchange can be accessed by many users who have the required permissions. To ensure that these shared inboxes are secure, it is imperative to regularly audit user activities. This can be done using the native Exchange tools, but the process can be time consuming and reactive. 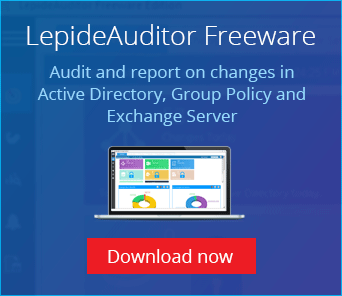 To ensure real-time auditing of Exchange Server shared mailboxes, you may wish to deploy a pro-active solution, like LepideAuditor for Exchange. This solution automates auditing to help tighten security and enables organizations meet regulatory compliance challenges.